Amy Cannon is a Program Coordinator at IEA. She has worked here for over two years and in the administrative support of educational programs for over six. Her primary focus at IEA is on the Yunasa camps. I am probably most energized by gifted kids’ excitement to know and understand the world. So often, their desire to question and explore is dampened by teachers who want them to stay on task, peers who pressure them to fit in, and parents who aren’t sure how to meet their children’s insatiable need to know. It is this motivation and drive that makes the gifted so likely to shape our future – to contribute inventions, innovations, and discoveries to our world. I love the spark of curiosity I see in all the kids we work with and want to do what I can to fan that spark into a flame! 2. What is one thing you think every family with a gifted child should know? So often parents will call or email and talk about how unique their child’s situation is – how few equal peers they have, how they present a novel challenge to their school structures, how what they deal with is unlike what they see around them. As someone who administers programs for the gifted, I can assure them: “You are not alone.” There are others out there who have the same struggles, the same challenges, and the same wonderful gifts. 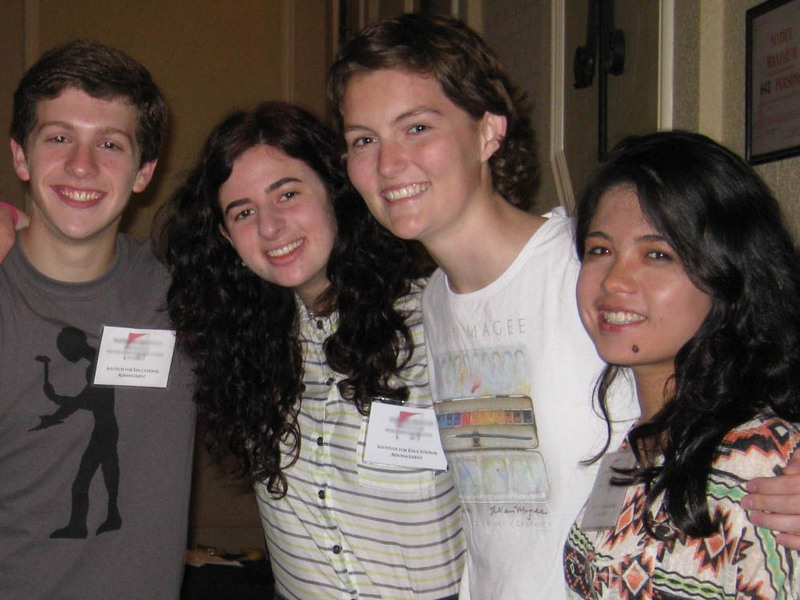 What I love about Yunasa camps, and about all of IEA’s programs, is that we provide the opportunity for the gifted to connect – across the country and sometimes across the world – with others who are like them and who share their experiences, joys, and challenges. To observe the strong friendships and lasting community forged in our programs among our constituents is one of the most rewarding parts of my job. 3. Why do you enjoy focusing on the program that you do? Yunasa camps are my main focus as a Program Coordinator. All our programs are wonderful and rewarding opportunities, but I particularly enjoy working with Yunasa because of the opportunity to go to camp! I love the outdoors; that I get to go kayaking or build a Nature Sculpture with campers as a part of my job is unbelievable! I am also immensely grateful that I am able to work so closely with our Yunasa Fellows, world-renowned experts in the field of giftedness, and wise, kind, sensitive people from whom I personally have learned a great deal. 4. What’s your favorite Yunasa tradition? Yunasa summer camps, as with most summer camps, are rich with traditions that are handed down from year to year. My favorite tradition might be the opening and closing ceremonies. The campfire, the drum beat, and the songs are the same, but the feeling is so different from the beginning of the week to the end. I love feeling how the traditions have deepened with the campers over the span of just one week! 5. What’s your favorite snack food? I love cheese more than is probably healthy. I love a spread of cheese, crackers, fruits, and meats. It feels “fancy” but is excessively easy to put together! 6. What’s a movie you watched recently that you liked? I recently watched “Paper Moon,” which I loved. It has Ryan and Tatum O’Neal, a real-life father and daughter playing a father and daughter con artist team in the movie. Tatum O’Neal was the youngest actor ever to receive an Academy Award, which she won for her portrayal in this movie at age 10. It was made in 1973, is set in the Great Depression, and is funny, witty, and moving. I’m a voracious reader, so I spend a lot of time doing that! Since moving to Pasadena, I’ve tried to take advantage of being so close to the San Rafael Hills and San Gabriel Mountains and get in a lot of hikes! I also very much enjoy exploring around Los Angeles – Chinatown, Our Lady of the Angels cathedral, Little Tokyo, Olvera St. Taking the metro around L.A. and finding new places to explore and cultural opportunities to benefit from make me glad to live in such a vibrant city! Recently, I took up the ukulele – though I’m far from proficient, it’s come in handy for a sing-along or two. Sadly, I don’t think it will fit in my carry-on for camp! There are still a few spots left for this summer’s Yunasa and Yunasa West camps. Apply today to join Amy and the Yunasa Fellows in Colorado or Michigan! Have your kids been to Yunasa or a camp that allowed them to connect with other kids like them? Please share your experience in the comment section below! Every gifted child has a unique story. 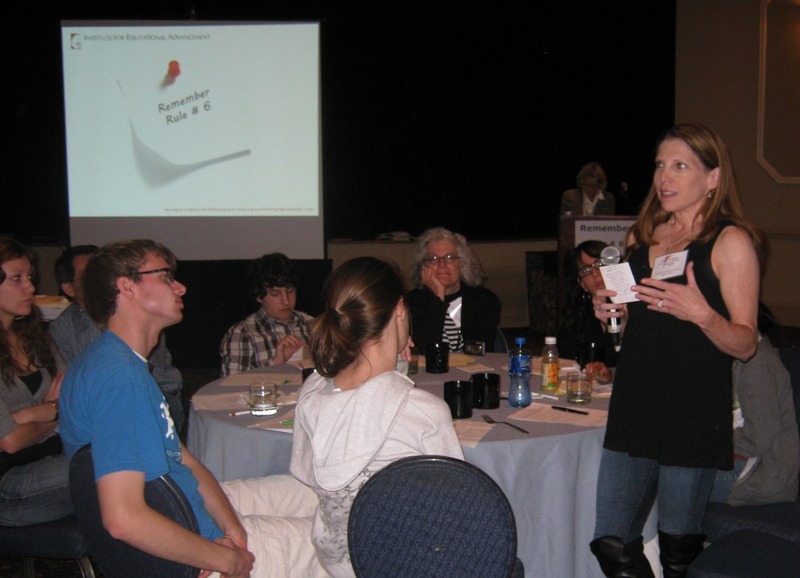 The following story is the second in a series of posts highlighting gifted children and adults we have found through IEA programs, depicting the many faces of gifted. Sophia is an alumna of the Caroline D. Bradley Scholarship program, which awards highly gifted applicants with a four-year scholarship to a high school that fits their individual intellectual and personal needs. Here, she shares the experience she had volunteering in New Orleans. 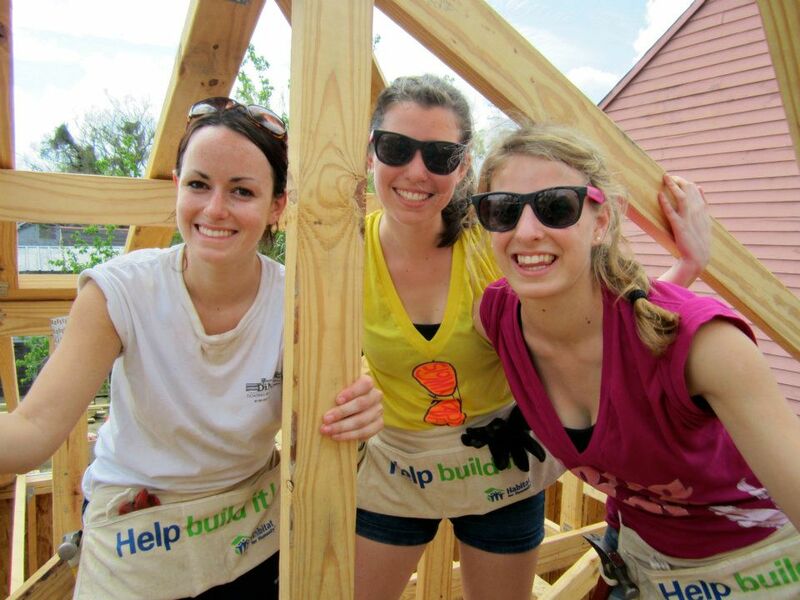 Sophia and her friends traveled to New Orleans to help build houses for those in need. This March, I went on an Alternative Spring Break trip with 105 other George Washington University students to New Orleans, Louisiana, where we worked in public schools and built houses for seven days. 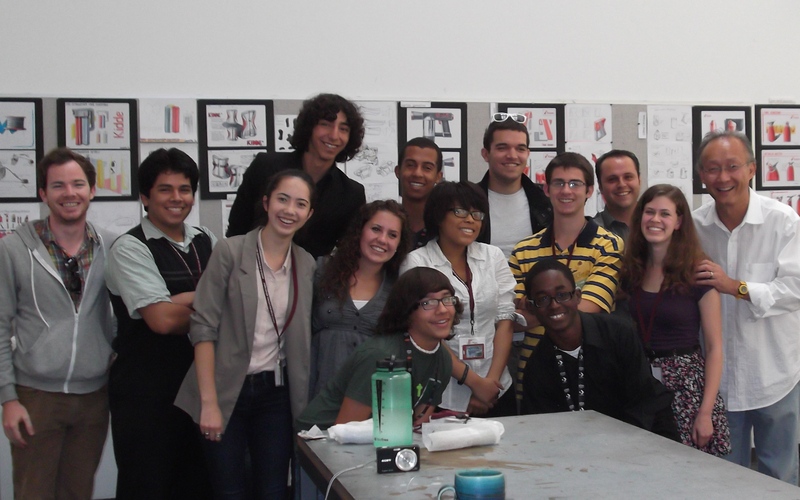 The process to get to and from New Orleans from Washington was organized and led by students. We asked for spare change at subway stations, wrote grant proposals, did letter writing and online donating campaigns, sponsored each other in marathons, and forged partnerships with local vendors to share some of their profits with us. We rode a bus for 22 hours each way to get there, stayed at a sleepaway Christian summer camp in rooms full of bunk beds that slept near 40, and ate the cheapest food you could ever imagine, but we managed to stay within our means. The service was a rewarding and fun way to meet other students like me who are passionate about service to others and put in tangible terms the power of people to change and affect the lives of others for the better. I worked with 6th and 8th grade students in a KIPP Public Charter School, and I worked with half of the students on the trip to work towards the completion of one house and began the foundation of another. Our entire crew completed three homes and began one more. We also talked to Teach For America Corps members about their time working in New Orleans schools, and public charter school administrators about the process of improving New Orleans school systems post-Hurricane Katrina. The trip was my first ever visit to New Orleans, and not only was I able to experience the vibrant culture of the city, but I learned more about the challenges and adversity that have faced our fellow Americans since Katrina in 2005 and how much more is still left to be done. As an international affairs student passionate about global health, public service, and education, my trip was an amazing opportunity to work domestically to help the lives of others, and however great or small our impact had, it was gratifying to know that we were part of the effort to rebuild New Orleans. Thanks for sharing your story, Sophia! Have you or your kids participated in any service activities like Sophia’s? What was your experience? Please share with us in the comment section below!